Whether you are new to essential oils, a long-time user, or a healthcare professional wishing to integrate essential oils into your practice, this book will quickly become your go-to resource! Endorsed by MDs, DOs, NPs, and doulas. Thousands of hours of research, clinical observations, ancient practices, and practical use are distilled into this ultimate guide to essential oils that combines evidence-based research with the art of natural healing to realize the maximum benefits of therapeutic essential oils. 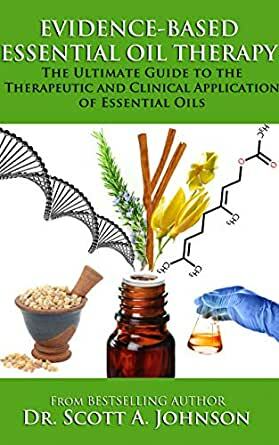 ~In depth profiles for 88 botanical species of essential oils including cautions, possible substitutes, dilution range, primary compounds, therapeutic properties, cautions, and supportive science. ~ Hundreds of research studies summarized in one or two sentences. ~Simple to follow protocols for more than 450 common health conditions. ~A section specific to essential oil therapy for children including protocols specific to age groups for more than 100 childhood ailments. ~A complete guide for using essential oils safely and effectively during pregnancy, labor, childbirth, and lactation that includes more than 70 protocols to help make these special times more enjoyable. ~Comprehensive safety information, including interactions with medications. ~Answers to the most common questions about essential oil therapy by both lay persons and practitioners. Dr. Scott A. Johnson is the bestselling author of ten books and more than 300 articles featured in online and print publications. He is the creator and founder of the Integrative Essential Oils Essential Oil Certification Program, and the originator of the Waterfall TechniqueTM. He has a doctorate in naturopathy, is a board-certified alternative medical practitioner (AMP), Certified Elite Essential Oil Specialist (CEEOS), Certified Clinical Master Aromatherapist (CCMA), and Certified Professional Coach (CPC). His evidence-based approach to natural healing and experience conducting medical research make him one of the world's leading experts on the therapeutic application of essential oils. Dr. Johnson pioneered evidence-based essential oil therapy, which combines the art of ancient healing with modern science to maximize the benefits of essential oils. One of his research focuses is the safety of essential oils, and he has published internationally on the subject. He is an acclaimed international speaker and has delivered keynote presentations across North America, Europe, and Asia. Dr. Johnson draws on his wealth of experience and diverse educational background as he travels the globe to share the secrets of natural healing with those who seek greater wellness. Can't say enough about how much I love and appreciate this book!!!! I had been extensively researching EO's and had some frustration at the differing schools of thought & so much contradictory information. I did not want to just put out the money and effort and time with EO's based on a person's word that they worked, or worse yet, some MLM company that just wants to sell as much as possible. I wanted something completely scientifically based to show/prove to me how and why these oils work. I love that I can look up virtually any oil and not just find the therapeutic properties, but the compounds listed they have that give them those properties. Also included are the recommended dilution, notes, and all the cautions for the particular EO. Out of the 8 EO books I have purchased in the last 6 months, if I could only have one, it would be this one. I've been reading books and web sites researching EO's for over 6 months and this is the first time I feel I found a totally comprehensive resource that helps me actually use EO's effectively and safely, as well as with confidence. I'm no longer just using because someone else said such and such oil was good for that purpose. This book has 2446 references!!! I have looked up a few of them. This is really appreciated, knowing the statements and advice given in the book are all backed up by studies. I'm especially appreciating the section on EO's for children and all the information throughout the book that includes how to use with children. I have 5 grand kids and it puts my mind at ease. I want to know what I'm doing if I offer EO's to help my grand kids. I love the dilution chart in this book. In fact, I'm going to copy it and laminate it to put with my oils. I've seen other dilution charts and frankly, they didn't make sense to me for some reason and this one does; very very easy to use. There are two helpful chapters to look up suggestions on what to use for specific conditions. I appreciate that it's not just what to use but HOW to use as well. I'll probably also print out the Quick Reference Guide. Wonderful resource.....at a glance you can see any cautions for children, oral use, drug interactions, etc. Appendix C is a resource I have often looked for since using EO's. You can look up a therapeutic property....such as antibacterial; anti-inflammatory; antiseptic; diuretic; stimulant; sedating; wound healing......and under each find a list of oils that have the compounds with those properties. This is very nice, because most references seem to have a list of oils and tell you what each do, but when you are looking for a specific thing, it can be frustrating to have to look through each oil skimming to find the properties you are looking for. I'm turning this into a workbook for myself. As I go through studying some of my favorite oils, I'm adding to their profiles page the dilution information (he already has percent listed, I'm adding drops per tsp.) and also adding onto the page some of the cautions so that more information is all in the same place for the oils I use the most. Dr. Johnson has another smaller book with essentially a snap shot of most of the same information. There is one difference and that is with the cautions chart for drug interactions. This book lists the drug/conditions and then the oils that might interact. Such as you look up "iron deficiency" and find which oils might exacerbate that condition (leach iron out of your system). In his other book that same chart is flipped......you look up the name of the oil and find a list of conditions/drugs it might interact negatively with. I'm not completely sure which chart I like best, but I think I like the one in the other book so I can look up the oils I'm using and see the cautions quickly. The thing this book needs the most is tabs!!! I have started adding some of my own markers as I'm constantly flipping all over this book. 5.0 out of 5 starsForget the Others - Invest in THIS Book. I was recently introduced to essential oils by my daughter, and was immediately intrigued. Not knowing much, I went in search of a book that could provide the information I sought. I found, and ordered a number of books claiming to be 'the beginner's guide', 'the ultimate guide', etc., but either still had questions, or found myself jumping from book to book to track down something I'd read. Then, I found this book. This truly is the ultimate guide. First, Dr. Johnson provides in depth information on essential oils - their history, use, and application (oral, topical, inhalation...) along with his recommendation of the 42 basic EOs. Name, Scientific Name, Family Name, Note, Aroma Intensity, Aroma, Common Extraction Method, Possible Substitute Oils, Blends Well With, Recommended Dilution Range, Primary Compounds, Other Compounds, Cautions, and Evidence (with cited references). The following chapters include Essential Oils for Health Conditions...Children...Pregnancy, Labor and Childbrith. After that, you'll 2446 cited references. If these things don't mean anything to you now, don't be intimidated! It will come to you as you read. But, my point is, beginner or not, this guide has everything you need to know. Do not waste you money on another book only to find it lacking. For me, this is the final 'go to' source for information. I am an aromatherapy student with Heart of Herbs Master Aromatherapist program. I wish I had asked some of my peers about this book before I purchased it. The author's credentials don't stand up to scrutiny, and the book contains VERY unsafe protocols for undiluted use of essential oils. "Neat" or undiluted oils has been linked to skin irritation and development of sensitivity, sometimes severe. Once an individual develops sensitivity, they can NEVER use that essential oil again, and often none of the essential oils within that family that contain similar chemical constituents. For reputable books on essential oil use and safety, please see Shirley Price, Demetria Clark, Valerie Ann Worwood, or Robert Tisserand. Avoid this book. It is full of extensive misinformation masquerading as "evidenced-based" therapies. 5.0 out of 5 starsI use it almost every day. This book is full of useful information and practical applications. It covers a full range of physical, emotional/spiritual uses for EO's. There is information on homeopathic remedies and also good quick references for safety issues, pregnancy, and compound specifics. The way the information is organized makes it very easy to find exactly what you need. If you are looking for a book that tells you what to do with each specific oil you may not want to start with this book. It's a lot of breakdown of the compounds in each oil and references from scientific studies on very specific things which are useful for study, but not really for a beginner wanting simple application information. There are blending suggestions and information on what each oil is good for, but there is better information on that stuff out there. As an RN, I have begun using essential oils in the workplace. I wanted to ensure I was not causing any harm or contributing to any symptoms or causing new issues for my patients. This evidence based book has the information I was looking for to feel confident about using the oils. I have studied essential oils/ clinical aromatherapy but wanted something that tied it all together for me, this is the book that does just that.